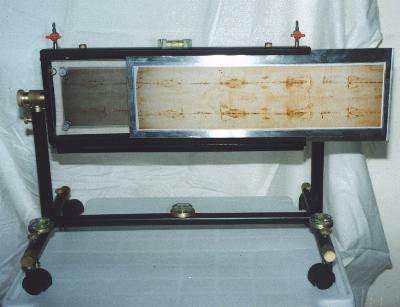 The project of determining a new location for the Shroud was studied in such a way as to assure the maximum safety to the relic, the possibility to keep it in extended, plain and horizontal position, and the possibility to use the same structure during the exhibitions, avoiding any handling of the Shroud. This general project allows, as much as possible, for all the indications presented in the course of the years to optimize the Shroud preservation. For instance, the studies of Prof. Alan D. Adler and Dr. Larry A. Schwalbe and also the conclusions (lately notified) of the International Commission for the preservation that is studying the problem. The proposal, that concerns the real structure of the Shroud container, requires deepenings as for the choice of the gas (that will allow the maintenance of climatic and environmental opportune and constant characteristics) and the system of general protection (thief-proof devices, self-extinguishing systems against fire, further bullet-proof and antieffraction coverages, illumination and videotaping systems during the exhibitions). Arguments that lie outside the discussion about the structure itself that must be realized to host the Shroud. To be clearer as to what we are going to illustrate, a prototype of the real structure on the scale of 1:10 was created, thanks to the precious help of Massimo Ghione, laboratory technician at the Technical School for different sectors of industry "E. Fermi" of Rome, who made possible the practical realization of the theoretical ideas that follow. Obviously, being a scale model, all the automatic mechanisms that would be necessary weren’t included. This is mainly due to the difficulty or the impossibility of finding, in practice, devices on the scale 1:10 that are also available in real scale. For instance, the motors for the lifting of the Shroud container, the motors for the rotation of the container, the motors for the displacement of the structure and for the block of the wheels with the automatic lifting of the whole structure, etc. To obviate these practical problems, the electric or electromechanic motors were replaced by manual mechanisms. The structure has a varying encumbrance, according to the configuration that will be established. In fact it is possible to vary the position in height of the Shroud container, as well as the position in horizontal or vertical. To be clearer, next to each image will be also pointed out the relative encumbrance for that configuration. In this first image the structure is set on wheels and the Shroud container is in the horizontal position. One can note the two pipes that, on the back, allow the entry and the exit of the gas for the checked atmosphere and the four wheels that allow the structure to move in any direction. For the life-size realization, because of the weight we recommend the movement automation by means of a directional remote control that through a joystick will allow the displacements (like radio-controlled miniatures). This configuration encumbrance is 5.3 m length and 3.6 m width. The height is 3.1 m ca. In this second image, the structure is placed on four supports that lift it and prevent the movement on wheels. You can note the three spirit levels that allow a perfect horizontal positioning of the structure itself also in presence of inclinations or imperfections of the floor. The positioning mechanism of the structure on supports can also be motorized, since the weight could complicate and prolong the manual operations on the life-size structure. This configuration is that one that should be used during the periods in which the Shroud is not being displayed. The encumbrance of this configuration looks like the previous one and that is 5.3 m length and 3.6 width. The height is on the contrary 3.2 m ca. In the third image there is a side-view of the structure that should contain the Shroud in which one can note the faucets on the back that allow the entry and the exit of the gas for the checked atmosphere inside the Shroud container. The pipes that were applied are purely indicative, since the apparatus that will produce and check the microclimate inside the Shroud container will be set at a certain distance from the structure itself and therefore the connection pipes will depend on such positioning. Moreover the faucets go into the Shroud container that, therefore, is directly interested by the entry and the exit of the gas for the checked atmosphere. The faucets are necessary for the purpose of isolating the container during the displacements. You can also note a fourth spirit level set between the two faucets that is useful to control the perfectly horizontal positioning of the Shroud container when, during the exhibitions, the two side arms of the structure could be lengthened and the container set vertically. 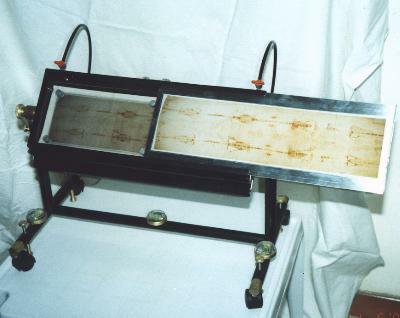 In this fourth image, the Shroud container is rotated to pass from the horizontal position (preservation state) to the vertical position (exhibition state). In the scale model, the ferrule of rotation is graduated every 45° with a ball-mechanism to allow a safe vertical positioning of the Shroud container. 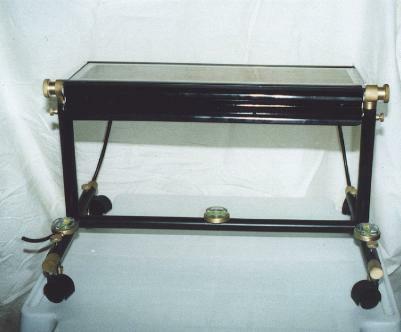 In the life-size model this mechanism too must be automatically regulated by means of a telecontrol to prevent abrupt displacements of the Shroud. In this fifth image, you can note that on the protective glass of the container there is a panel with the photographic image of the relic that covers and darkens the real Shroud inside. This kind of panel in the life-size model could cause problems of manageability (it’s about 4.5 m long) and therefore it could be replaced by darkening curtains electrically driven or by smaller panels that insert in sequence. The photographic image on the panel is necessary to satisfy the visitors’ curiosity in the periods between exhibitions. The sixth image is relative to the vertical positioning of the Shroud container and is therefore the configuration that the structure should assume during the exhibitions if one doesn't want to lift the container by means of the two vertical arms of structure itself. The relic is fixed with magnetic wedges. Upwards you can note the two faucets that allow the entry and the exit of the gas for the checked atmosphere, the spirit level for the perfectly horizontal positioning of the container and the two check pins that lock the drawer that contains the Shroud. In the life-size version we recommend the replacement of the two check pins with a disappearing safety system. The encumbrance of the structure with this configuration is 5.3 m length, 3.6 m width and 3.7 m height. This seventh image shows the Shroud container with the upper cover removed. You can note how the Shroud, inside the container, is less visible than the photograph outside because of the protection glasses. The use of photochromatic glasses should be also considered. They are sensitive to the light and will allow for good visibility of the Shroud, but won’t let the Shroud itself suffer heavy thermic ranges due to the external illumination necessary during the exhibitions. A closed circuit system that will allow a close vision of the Shroud on megascreens placed inside and outside the Cathedral, like those used during the papal audiences when there is a great crowd, should also be considered. Therefore the choice of proper glasses must also foresee this important aspect of the exhibition. The eighth image concerns the vertical positioning of the Shroud container lifted on the two side arms of the structure during the solemn exhibitions. The operation should be automatized in the life-size version since the excessive weight would not allow an easy manual operation. Moreover the spirit level placed on the container allows a perfect horizontal positioning of the container itself. The encumbrance of the structure is 5.3 m length, 3.6 m width and 5 m height. In the ninth image one can note the extraction of the drawer that contains the real Shroud. 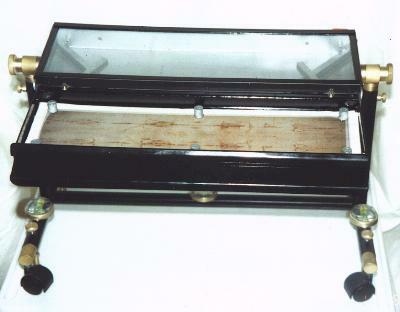 This drawer is also provided with safety glass, that could be removed whenever one wishes to reach the Shroud. You can also note the six magnetic wedges that lock the Shroud on the bottom of the drawer. 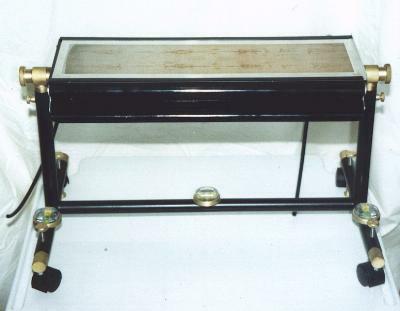 It is also possible to see the pantograph arms that allow the drawer discharge from the rotating container. On the upper part, inside the container, are also visible the terminals of the two faucets for the control of the inside microclimate. It is taken for granted that during the extraction operations the control system of the inside atmosphere is temporarily disconnected with the closing of the faucets. 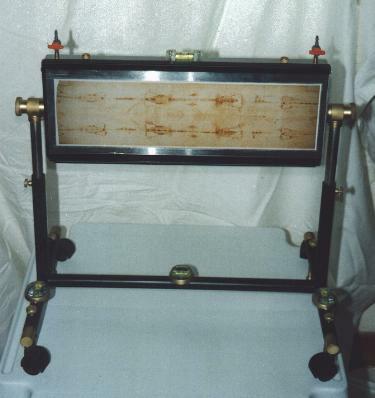 The drawer could be easily removed, for possible new examinations, or drawings by means of the anchorages at the two pantograph arms that are visible immediately above the Shroud. Obviously a table on which to place the container must also be provided. 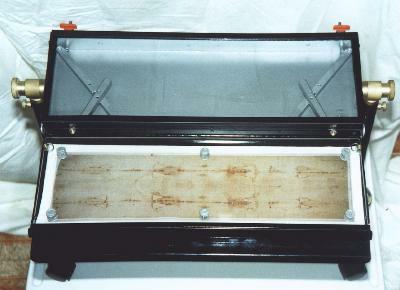 In the tenth image you can see again the drawer containing the Shroud but without protection glass. Here too the magnets that lock the Shroud are visible, as are the faucet terminals for the microclimate control and the arms that allow the discharge of the drawer itself. Obviously, this system must be totally watertight and the (double) glass safety, thermic and photochromatic to allow a better visibility of the Shroud itself without damaging the relic. It is not easy to briefly explain the concepts that led to the formulation of this project, because, as already mentioned, they are a synthesis of years of studies and works of various international scientists. The fire that damaged the Guarini Chapel and the Turin Cathedral last April has accelerated the realization of the prototype about which we wrote and has made necessary its presentation accompanied by a report that could not be in this occasion exhaustive. The complete treatment of the themes inherent in the preservation and the exhibition could be object of a more detailed work in sight of the International Congress of Turin in 1998. The criterion that inspired the realization of the provisional structure that since 1993 kept the Shroud during the restoration works in the Guarini Chapel and, still before, the altar of the architect A. Bertola, seems to be surpassed by the present conclusions of the international Commission for the preservation. 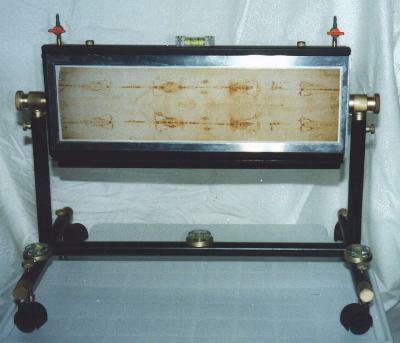 In fact the Shroud won't be kept rolled up in a cassette any more but unfolded on a flat plane. This obviously will involve a change of location that, presumably, will also make necessary changes in the Cathedral or in the Guarini Chapel. Moreover this structure must necessarily answer to the actual demands of impracticability of the Cathedral itself and therefore to the practicality of deplacement, taking for granted the safety. In the definitive location of the structure, it would be opportune to cover it with a bullet-proof glass dome openable in case of need, on the model of what was realized for the "Pity" of Michelangelo in St. Peter in Rome. Moreover the location should be accessible to the pilgrims, but at the same time checked by a safety circuit of cameras connected to the Police and the porter’s lodge of the Royal Palace. Automatic systems of fire and smoke control with intervention of automatic extinction should also be installed. As for the illumination, we retain, as already mentioned, the use of photochromatic glasses and lights with a power lower than those used for the public exhibition in 1978 (6 KW) with television provided on megascreens like those used for the papal audiences in the Vatican. 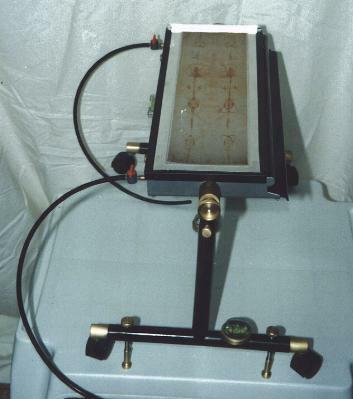 This solution would avoid further thermic stress and therefore a possible worsening of the image situation on the Shroud cloth. Moreover the pilgrims could appreciate in the greatest detail the close view of the Shroud (that would be impossible from the usual distance) and an excessive overcrowding would be avoided that would also lower risks from possible mythomaniac or ill-intentioned persons. 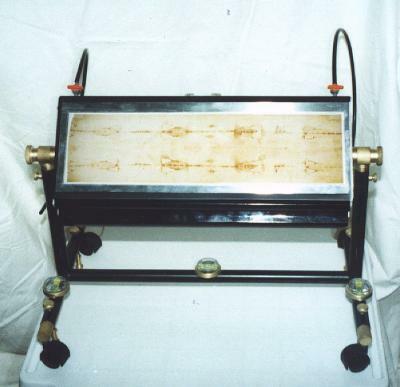 Moreover, the yet unresolved mystery of the image formation doesn't allow, at present, the use of definitive preservation techniques (like the complete and drastic disinfestation of the Shroud from bacteria, fungi and parasitic microrganisms) without running the terrible risk of destroying the object itself or the image present on it. Therefore, waiting for more advanced studies that will contribute to definitely disclose the formation mechanism of this "impossible" image, we limit ourselves to propose to avoid interventions with an uncertain result for not having on one’s conscience the responsibility to have destroyed the only mystery that interrogated, interrogates and will interrogate thousands of scientists.